While many expected a high-scoring offensive explosion, this year’s Super Bowl ended up featuring a battle of defenses between the New England Patriots and the Los Angeles Rams. The championship game took place at Mercedes-Benz Stadium in Atlanta. Skyhook decided to continue our annual tradition of analyzing the makeup of attendees of the Super Bowl and providing insights on the everyday behaviors of the two fan bases to help advertisers and the sports teams alike identify what their brand preferences are. At Skyhook, our location network and partners provide us with access to massive amounts of anonymous, precise mobile device data. This data allows us to generate valuable insights into anonymized behaviors of mobile users as they move throughout their day. In this case, we processed the location data of anonymous mobile users attending the Super Bowl against our venue database, to determine the brands and places they frequent on a regular basis. This process calculates fan brand affinities based on where the devices have visited stores and other commercial businesses. Attendees of the Super Bowl are more affluent than the average American, with many making $100,000+ annually. A majority the attendees at the game fell between the ages of 30-65. Not surprisingly given their income levels, we estimate based on census block homing that more people at the gamehold a Bachelor’s degree or higher compared to the overall U.S. population (47%). Attendees from California represented a more diverse spread of ethnicities compared to fans from New England states. In a large shift from last year’s Super Bowl, we saw a higher number of local attendees at the game from the host state of Georgia than from either of the teams’ home states. Loyal Patriots fans from Massachusetts still turned up in large number this year, and had more of a presence than opposing Los Angeles fans, which may not be surprising given the Rams may still be continuing to build out their fanbase after moving to Los Angeles only two years ago. Interestingly more attendees ended up coming to the game from Florida than from California, one of the fan bases’ home states. People who attended one or more of Patriots' home games this season were more likely to travel to Super Bowl than people who went to only one of Rams' games. We compared the preferences of New England attendees to California attendees to identify similarities and differences in their brand preferences and general shopping behaviors. Interestingly, California fans indexed as being higher live sports attendees than New England fans. The assumption here could be that even though fewer fans made the trek from California than New England, those fans who did travel are more passionate about seeing games live. All of the attendees over-indexed as being both avid travelers and business travelers. Both fanbases prefer Enterprise as their car rental company of choice, and both over indexed as preferring Marriott and Residence Inn hotels. Both groups value maintaining a healthy lifestyle, but California has the edge in terms of actual gym visits, with Equinox and 24 Hours Fitness being two of the most popular work out chains. Both groups also enjoy dining out, although California attendees again appear to do it more often from both an upscale restaurant and QSR perspective. More California fans were identified as being avid casual diners than New England fans. Attendees from both California and New England shop more than the average American. Californians shop more for women’s and children’s apparel while New England fans over index for being male apparel shoppers. Not surprisingly, New England attendees also have an edge as sports apparel shoppers. This year’s Super Bowl may not have been the most exciting one in recent years, but it still drew loyal fans from both teams as well as many locals. 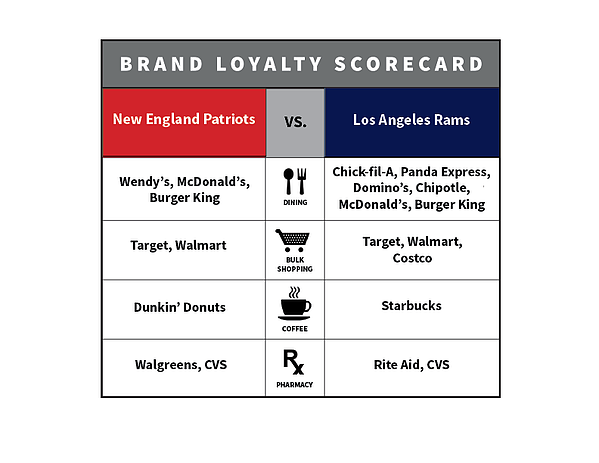 Brands that these two fan bases also show loyalty to in their every day lives should keep these findings in mind as they continue to advertise to them during this offseason. Personalization and special offers could be the key to winning big and scoring more fans.